"Santa Clara County, California. 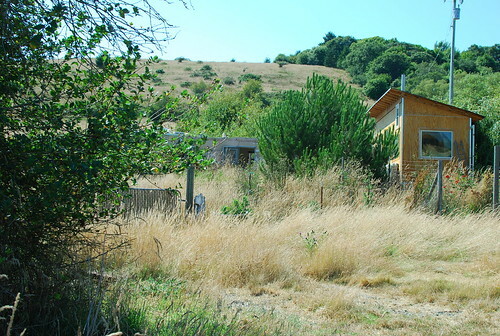 Built 1840's or 1850's"
"Lulu's tiny house, in unincorporated Sonoma County"
Proponents of tiny houses in America (or what are called "normal" in other parts of the world) insist that there are other parts of this list that are excessive. For example, the idea that you need a different room for sleeping and eating and gathering. In Japan, you fold up your bed and put it in the closet every morning so that you can set out your table (no chairs). At that table you entertain, do homework, and eat dinner. "McMansion: Symbol of Real Estate Boom"
Homes that are called "luxury" by developers aren't really all that fancy, but they do have more of the stuff listed above. Ardis Huges. For the U.S. War Bonds Committee. 1944. Image courtesy of michal_hadassah via Flickr. a sunroom/conservatory to spend most of the winter in. I sure wouldn't mind a hot tub or o-furo soaking tub to de-stress in. Incorporating these things seamlessly into a home design does take a lot of forethought. Throwing them together would just end up as a jumble of rooms (not a home). and not too much space that I have to clean! Draw a plan of your house (or a dream house, or both) and your yard, including fences and sidewalks (context) at 1/8" scale. Step 1. Make a rough sketch of the property and home. Step 2. Write down the dimensions (you'll need a good tape measure) on your sketch. Focus on the sizes of rooms and hallways/stairs. Step 3. Using 8x8 gridded paper or by laying down tracing paper over a sheet of gridded paper, draw out your home. Each 1/8" square is one foot; each 1" square is eight feet. Assume three feet wide for doors and a minimum of four foot wide for hallways. You'll likely need to try this a few times before you get it right. Sometimes it's hard to choose where to draw until you know exactly how big your drawing will be. At 1/8" scale, you only have about 70 feet wide on your 8.5" wide paper. Some houses wouldn't fit on that, others fit just fine. Find a cool home for sale and go during a scheduled tour or ask for your own. There are many sites where you can search for open houses or look in the classified ads. 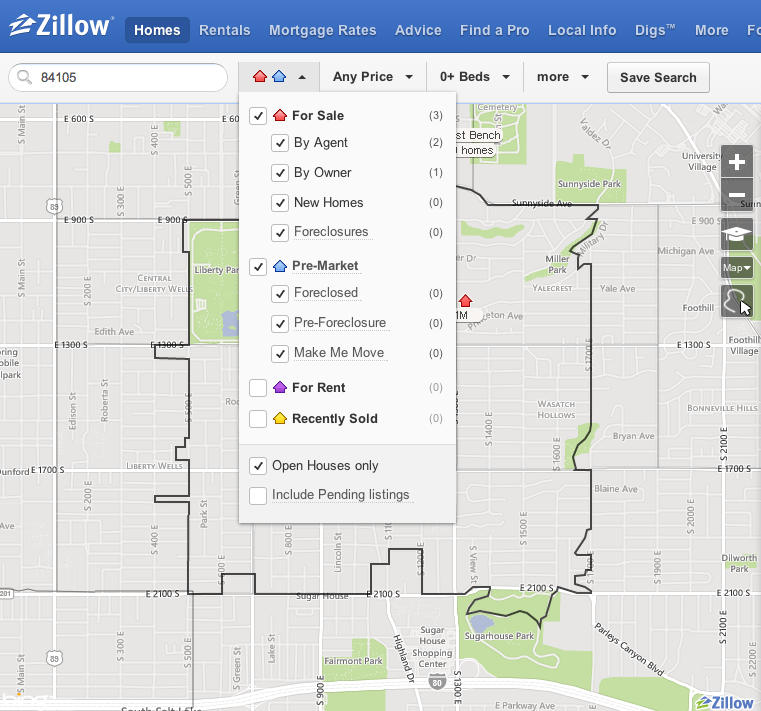 At zillow.com, after entering a zipcode, just click on the blue & red house menu and check "Open Houses only." After seeing the home, report back: what did you like and what would you change or do without? 1. What did people used to make their houses out of? 2. And, why have people stopped building their own homes? Ally: The simple answer to what people "used to" make their houses out of is "whatever they could find." 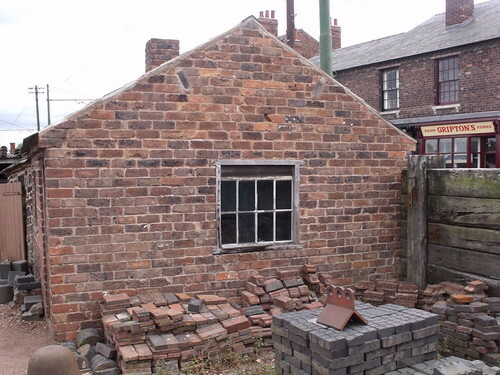 "Black Country Living Museum - Builder's Yard"
Image courtesy of ell brown via Flickr. Most places require walls and a roof. If they lived near a wooded area, walls might be made of wood. If they lived near a mountain it was stone. If they lived on a beach it was woven plant materials. If they had clay in the soil, they could air dry or kiln bake bricks or fill in between wood for waddle & daub walls. Bricks would have required specialized equipment; most villages might only have one brickmaker. Bricklaying, however, was a skill that most men would have in places where brick building was common. Roofing must be much more waterproof than walls. I cannot think of one type of traditional roofing that does not use slope and overlapping elements to shed water. 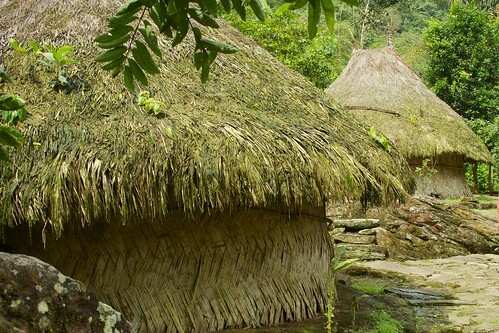 The "shingles" might be wood shakes, banana leaves, stiff straw, slate, or clay tiles fired much like bricks but given a protective sheen so that they are not porous. 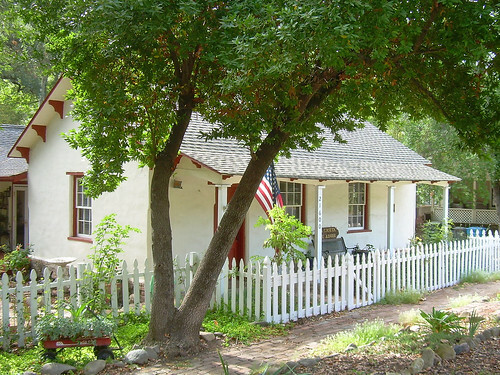 Roof structures were almost always made of branches, then timber, then dimensional lumber. This was the part that you really needed your neighbors to help with. Some places require a raised floor to escape flooding, but some might just have a dirt floor which is treated with blood or oils and compressed to approximate flatness. 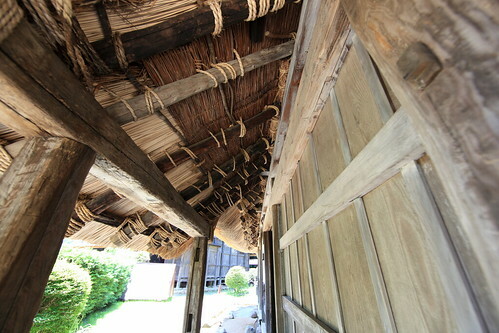 Flooring is often wood in the West, but might be straw or bamboo in the East. Some of the oldest flooring we know of is tiny pieces of stone in mosaic patterns. "mausoleum of galla placidia, ravenna"
Windows for a very long time were just openings with shutters. Before glass, thinly shaved translucent stone was used to let in a small amount of light through window openings while keeping the weather out. Early glass was even more delicate than what we have now, and needed to be in tiny panes or pieces; this is partially why stained glass designs with pictures were introduced. Doors have been made of wood for as long as there have been doors. They might also be made of metal for security purposes, but this would have come much later. *To be fair, due in large part to the efforts of environmentalist architects & builders, materials from one's own region are now back in vogue. 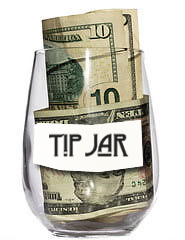 It saves on shipping energy & costs. It also makes more sense. Which brings me to your second question, Emma, and the answer is developers. Developers are why people don't build their own homes very often anymore. The first developer probably did it accidentally. Had some land he couldn't sell empty so he took a risk and built something on it before returning it to market. These days, it's difficult for a homeowner to find land that is legally "buildable" that hasn't been scooped up by a developer. In fact, if you try to buy land today, (give it a try!) you will find that the people selling land to potential homeowners are developers. So you buy a plot from a developer and he's already gone through the lengthy and labyrinthian process of getting it approved for a building. He gives you a choice of 3 or 4 floor plans and a preferred contractor or two. The construction is part of the land deal. 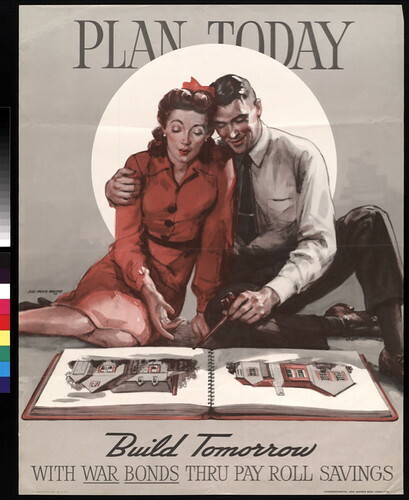 Say you reeeeeeally want to build your own home. What's a person to do? If you google it, you'll get advice on how to be your own general contractor (hiring subcontractors to do the work) or how to hire an architect or contractor. Also, there all sorts of permitting and licensing and zoning and building code requirements that are meant to keep us safe from shoddy workmanship and houses that fall on our heads, but they also really complicate things for your basic limited-budget-but-handy-with-tools gal or guy. There are a few DIY options, but that's a whole 'nuther discussion.